Are you thinking about participating in NaNoWriMo (National Novel Writing Month) in November? I have a deadline so I’m going to miss NaNoWriMo, but I often have to write and polish a book draft in 6 weeks. 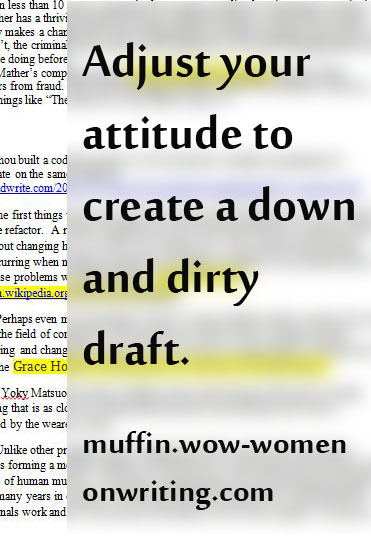 To succeed, I had to adjust my attitude about that first draft. Start with an outline. I’ve heard a lot of writers say that an outline kills spontaneity. I keep my outline spare, but it gives me something to follow so I know more or less what needs to be in each chapter. I can always change my mind if something doesn’t work or if a better idea comes along, but it gets me started. Leave gaps. When I have to pound through a chapter (roughly 1650 words) a day, I don’t have time to do the research needed to fill in every gap I’ve somehow left the first time I did the research. I’ll do a quick search, but if the answer doesn’t present itself, I leave a gap. They’re easy to spot because I always include a note (WHEN DID THIS ACTUALLY HAPPEN?) and highlight it in yellow. Don’t worry about the best possible word. Sometimes I get hung up trying to find a more specific word for something. When I catch myself opening the thesaurus on my computer, I close it again, highlight the word, and move forward. This is the sort of thing I can fix in the rewrite, assuming the paragraph survives that process. Some things just won’t come together. I finished a draft of a new nonfiction book last night. My last chapter contains more gaps than text, because chapters 1 through 8 aren’t solid enough yet for me to wrap the whole thing up. I simply highlighted the section headings where I couldn’t provide text. I’ll fill it in when everything else has taken shape. And that’s okay. Writing a down and dirty rough draft is liberating. It isn’t going to be perfect and I know it. When I get caught up angst-ing about something, I give myself a few moments and then push on. This isn’t meant to be particularly good. And neither is a NaNoWriMo draft. The point is to get it down so that you can make it better. 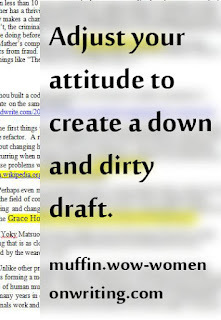 You can only do that, once you’ve finished that down and dirty draft. Sue is the instructor for our course, Writing Nonfiction for Children and Young Adults. The next session begins on November 9, 2015. Sue--I've been highlighting some "sketchy" parts as well. And as I've been revising what I have so far, I note the page number (right next to the title) I am up to so far, so the next time I begin a revising session, I know where I left off. I leave blanks as well--literal blanks. If I know there is a missing detail or I'm struggling with the perfect word, I will create a blank line and also highlight it, so I'm sure not to miss it when I go back later to revise. Thank you, Sioux. One more chapter and I'm just beyond the half way point.